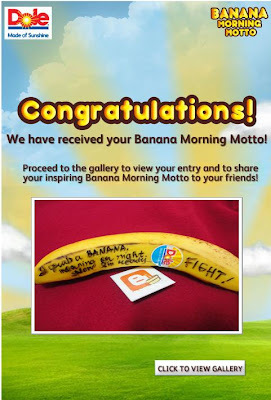 ruthdelacruz | Travel and Lifestyle Blog : I Want Banana in the Morning or Night, Everyday to Keep Me Up All Day! I Want Banana in the Morning or Night, Everyday to Keep Me Up All Day! Working in a night shift means "morning" typically starts just when about the sun goes down. It is not only difficult to know when to use a night cream and day cream in a skin regimen, or how frustrating it is to miss on night outs, and movie premieres, but it is most challenging to get peaceful and quality sleep and recharge after a tiring day (or should I say night) just when half of the world is sleeping. One thing is for sure, whether it is morning (Manila Time) or morning (Eastern Standard Time), I always have banana before having my first meal of the day. Fruits are supposedly desserts and should be eaten after meals, but I like mine before the meal - before rice and other fatty food invade my system. It does work for me because I felt that it whets my appetite, and prepares my stomach for a heavier meal. I don't want to sound like an encyclopedia, but I want to stress that bananas are packed with vitamins and minerals. They say that it is two times as many carbohydrates as an apple, five times as much as Vitamin A and iron, and three times as much as phosphorus. The minerals and vitamins that we need are in this wonder fruit. My parents know me too well that I always look for banana before having dinner and leaving for work, so my dad always buys bananas EVERYDAY, as if we have pet monkeys at home. If we don't have bananas at home, I can always grab one from convenience store. I love that Dole has started selling bananas in convenience stores so consumers can buy something healthy instead of the usual chips and donuts and footlongs. 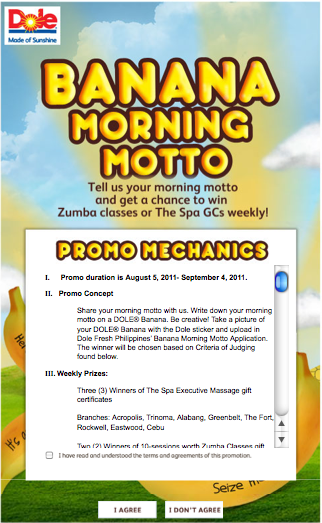 Interesting enough, I found Dole's Facebook Fanpage which has an on-going promo entitled, Banana Morning Motto. 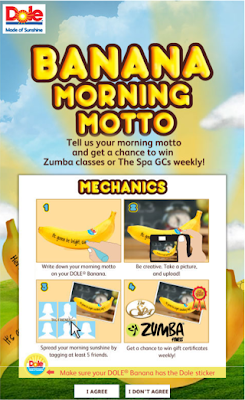 The goal of the contest is to encourage consumers and Dole followers to have a positive outlook about morning (don't we hate mornings which usually translate to deadlines and traffic?). 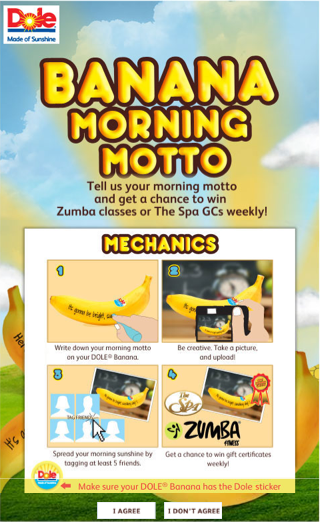 The motto should be written down in a banana (like a tattoo!). 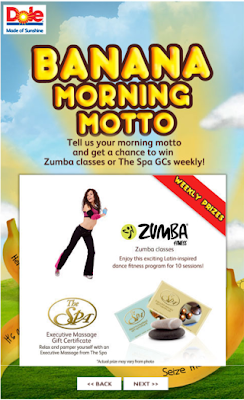 So I am joining this contest and I would show the world I am owning my morning! If you got inspired by my entry or just simply like my entry, please vote here. 1. Like the Dole Facebook Fanpage. The contest would run until September 4, 2011. 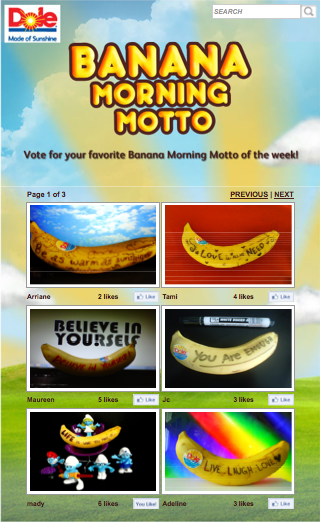 Check out the other cool entries at the Banana Morning Gallery. Winners could win Executive Massage GC from The Spa or 10 sessions of Zumba classes. If you need further info, check out the Frequently Asked Questions section. What would you write on your banana?! 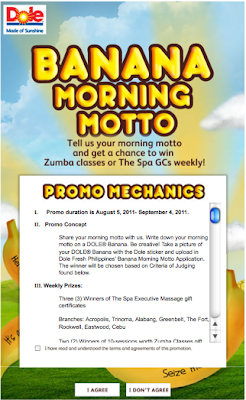 Note: Contest is Per DTI-NCR Permit #5769 . Series of 2011. © ruthdelacruz | Travel and Lifestyle Blog : I Want Banana in the Morning or Night, Everyday to Keep Me Up All Day!